Back to Tindledale with this novel from Alex Brown which is a village that has been brought to life be her wonderful stories over the last few years. Sam Morgan has returned to the village where his wife Chrissie and daughter Holly live, he has been away working hard at making a life for them, so they don’t have to worry about anything. Trouble is he has missed important dates, events and not been there to deal with his daughter’s condition. Chrissie, his wife is very reluctant to accept Sam back, in fact she doesn’t want him back. All Holly wishes is for her parents to be together again and perhaps she can help that happen. Jude, Chrissie’s friend and Holly’s godmother is back in Tindledale from America. She takes over the local antiques shop and thinks she can rebuild a life in the village where she grew up and not have to deal with anything from her past. It seems though that someone else’s past might well be there to change things for everyone. With a faded rock star to contend with, as well as her friends marriage problems and goddaughters problems, the peaceful life Jude wants may be a while in coming. This is a heart warming story which captures the problems of long distance relationships and secrets of the past. The village is not featured as much as previous Tindledale stories but you still get that feel of a community all coming together. There is plenty to make you laugh, cry and empathise with in this novel and that is what makes it a pleasant read. Personally not of the best Alex Brown novels but a good escapist read if that is needed. 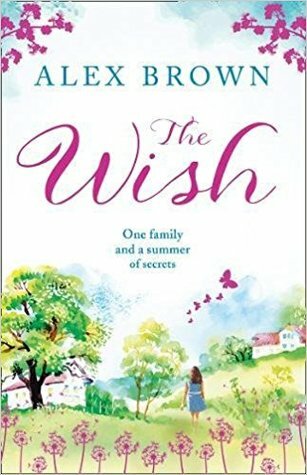 The Wish is out now.